It was about this time last year when I gave a shot at pinning down the definitive answer to the question, when was this picture taken? How hard could it be to figure out? It says when it was taken right in the caption! 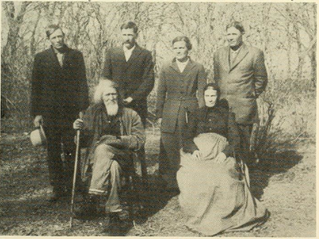 The photo of Thomas and Orel Jane Lovewell, their children, grandchildren, and at least one neighbor, was said to have been taken on the same day as a more often-reprinted pose of the pioneer couple with four of their children standing behind them, an illustration first published in a 1964 Republic County history, but reproduced in “The Lovewell Family” and in various books and newspapers since then. It’s in Gloria Lovewell’s 1970’s compendium of family lore that the caption shown above puts the date of the family get-together as May 1914. The gist of my blog last August was that the date doesn’t feel right. To me, the chilly landscape suggests late fall instead of mid-spring. Dave Lovewell pointed out that Ben Stofer, standing on the extreme right, seems to be holding an apple - which would also have felt right at home at a fall event. The occasion for the photo, I posited, might have been a celebration of Thomas’s birthday on December 20, 1913, an event written up in Kansas papers, which assured readers that a number of his descendants had attended. Does the newspaper’s identification hold water? The two family photos were definitely taken on the same day, since everyone appearing in both pictures is dressed identically in both (except for Thomas’s rumpled hat, which he wisely removed for the more dignified family portrait). I’d accept a bleak 21st of March before any day in May, but serious hurdles remain nonetheless. Aside from that niggling apple in Ben Stofer’s hand, there’s the matter of poor little Freida Lovewell, being hoisted by her Uncle Grant in the picture at the top of the page. Freida was born in February 1913 and died in 1915* at the age of 2 years. There’s precious little detail in the blurry image seen on this page, but Freida strikes me as rather dainty for a two-year-old. Thomas Lovewell and wife, for many years residents of the White Rock country, lately celebrated their golden wedding anniversary at their home in Lovewell, in the presence of twenty-five relatives and friends, including four children, their sons, Frank, Stephen and Grant Lovewell, and Mrs. Mary Stofer, being in attendance. A bountiful dinner was served at noon. Could this small item and the two photographs all be records of the same event? It’s tempting to respond with a resounding yes! It’s not just that the four adult Lovewell children pictured above are named among the twenty-five guests claimed by the News. I’ll save you the trouble of counting the number of relatives and friends in the family reunion photograph - there are twenty-five. Validation couldn't get any better unless we had a picture of the meal being served at noon and looking unmistakably bountiful. The one small problem is Freida, who not only looks too young but shouldn’t be there at all. If this is the Lovewells’ Golden Wedding Anniversary, she is the photograph's impossible girl. *This information from “The Lovewell Family” turns out to be incorrect. Freida died in 1914, aged 19 months.